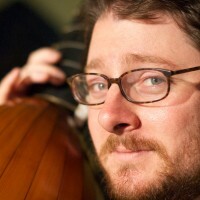 John Lenti's performances as a soloist and chamber musician on theorbo, renaissance lute, baroque lute, archlute, and baroque guitar across the United States and abroad have been described as “a joy to behold” (Seattle Times) and praised for their “nuanced beauty and character” (Gramophone). He regularly deploys his "unusually big sound" (Third Coast Digest) on all the various early music concert series, in opera pits, churches, libraries, theaters, Grange halls, and living rooms all over the place, the Boston, Berkeley, Indianapolis, and Salish Sea Early Music Festivals, and with, among others over the years, American Bach Soloists, Apollo's Fire, Bach Collegium San Diego, Carmel Bach Festival, Catacoustic Consort, Farallon Recorder Quartet, Haymarket Opera, The I-90 Collective, Magnificat, Magnolia Baroque Festival, Mercury Baroque, Mr. Jones and the Engines of Destruction, La Monica, Musica Pacifica, Newberry Consort, New World Symphony, Opera Omnia, Portland Opera, Pittsburgh Opera, Seattle Opera, and Seraphic Fire. He enjoys nothing so much as making music on tour with his chamber groups I-90 Collective, Ostraka, Sacro Profano, and Wayward Sisters. His recording credits include "Division" with Ostraka, "And I remain: three love stories," with soprano Linda Tsatsanis, chamber music of Matthew Locke with Wayward Sisters, and work as a sideman with La Monica, Seattle Baroque, and Portland Baroque Orchestra. As a founding member of Plaine & Easie and Wayward Sisters, he has twice taken top prizes in Early Music America competitions and is now, as you'd imagine, rich and famous. When not practicing one or another of the many historical plucked, fretted string instruments upon which he is expected to do something "adroit" (Washington Post) any given week, he may be found at home in Seattle with his wife, Sarah, singing songs, playing clawhammer banjo, and cooking simple food. He is a graduate of the North Carolina School of the Arts and Indiana University. He studied lute with Nigel North, Jacob Heringman, and Elizabeth Kenny and he strives to make himself worthy of that pedagogical legacy. Great musical help and inspiration have come at crucial intervals from Ronn McFarlane, Ricardo Cobo, Pat O'Brien, and Walter Gray.